As the only chartered professional body in the field of management and leadership, you are assured that CMI qualifications are of the highest quality. What are the benefits of a professional qualification with CMI? You’ll be more marketable – a qualification speaks volumes to prospective employers, giving you the advantage when looking for your next career move. You’ll perform better – a qualification will not only sharpen your existing skills, it will equip you with a range of ones. 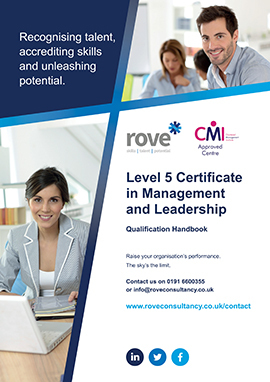 Why Study with CMI and Rove? Each year over 30.000 people study a CMI qualification. Over 85% of managers agreed their management and leadership qualification improved their performance and by transferring their new skills to the work place, almost all have seen a vast improvement in their teams’ performance too. 78% of employers agreed that qualifications provide quality assurance for customers and that the benefits outweighed the time, money and effort invested in obtaining them. More than 80% of managers say that taking a management qualification has resulted in increased professional recognition, with most stating that employers prefer qualified managers when recruiting. This was confirmed by a further 53% advising that their qualification had helped them in gaining a promotion. Which qualification is right for me? There are four tiers to this suite of CMI qualifications. This Award will help you to develop a specific aspect of your role, the Certificate will broaden your skills and knowledge, the Diploma will develop key skills needed to move on to senior management, and the Extended Diploma develops you further to give you all the key skills and competencies needed to become an effective manager. Please get in touch and our programme lead can advise the right qualification for you based on your experience, prior achievement and aspirations. We don’t have set enrolment periods so you can enrol on a time that best suits you. How is this qualification delivered? All of our CMI Leadership and Management qualifications are delivered via supported distance learning. This means that when you enrol you will be allocated a Tutor (subject specialist) who will support and guide you during your qualification. Support can be provided on the telephone, through email and by video calls. We also use a web-based system which you will be provided with an account for which allows you to access learning and study support materials and much more. You will also have access to CMI’s Management Direct website which provides great materials including e-learning, videos, articles, e-journals. We want to make sure that you enrol on the right course at the right level, so that you have every chance of success. This is best achieved through a one-to-one discussion with you so we can fully understand your goals and previous learning experience, as such we don’t currently offer on-line enrolment on our courses. If you’re interested in one of our courses please call us on 0191-6600355 or email info@roveconsultancy.co.uk, alternatively please enter your details and we’ll get back to you as soon as possible.